Goldfish are a good choice for beginners as they are quite easy to keep. However, they are not as hardy as some people think they are and they do need proper care. Also, they live for quite a long time, they respond to their owner and are probably the closest you can get to having fish as ‘pets’. Goldfish will become very tame in a tank and will investigate hands and fingers during tank maintenance, and they will feed from the hand (but see Hygiene). The Golden Rules for keeping healthy goldfish are so important that they are presented in a separate page here, covering the relationship between water quality and fish health in terms of stocking levels, overfeeding, filtration and water changes, with the aim of getting all these parameters right in order to reduce stress and the risk of ill health. Their natural range is temperate to sub-tropical. They are at the extreme of their physiological tolerance if kept with tropical fish, meaning they are likely to become stressed and therefore vulnerable to disease. Further, they produce much more ammonia than tropical fish and this will stress the tropical fish. They will eat small fish and are likely to be bullied by cichlids. At night, when they naturally rest near the bottom of the tank, they are likely to be pestered by fish like catfish. The faster-moving common goldfish, comets and shubunkins can out-compete the slower-moving, ‘fancier’ types such as veiltails and bubble eyes, so the long and short-bodied types should ideally be kept separately. Goldfish are sensitive to swimbladder problems, so pelleted foods should be pre-soaked (e.g. in a small cup of tank water) before feeding to help avoid constipation (bloating) and buoyancy problems (sinking or floating because of dry foods expanding in the gut and blocking the swimbladder duct). Fast any fish with such problems for a short while and try improving their diet. Drop leafy vegetables in boiling water or microwave them for a few seconds to soften the cellulose in the cell walls (and let them cool before feeding). Some breeders use oats for helping to develop the deep bodies of the veiltails, orandas and broadtail moors. Goldfish feed by rapidly opening their jaws into a tube which reduces the water pressure in the mouth and causes the food to rush in. They have pharyngeal ‘teeth’ (small bony tooth-like structures) at the back of their jaws to grind food before passing it into the gut. So they cannot actually bite and hurt one's hands. Do not overfeed! Goldfish appear to be greedy because in nature they are constantly browsing for scarce food and if you keep on feeding them they will keep on eating, to their detriment. They eat all the flake or pellets they need in a couple of minutes, once or perhaps twice a day. But they will browse on leafy vegetables. Do not feed fatty foods as their digestive systems cannot cope with them. Common goldfish will live for up to 40 years if kept in good conditions, so taking goldfish home should really be considered as a commitment, with proper attention given to housing and care. The more developed varieties (such as the short-bodied twintails) live shorter life spans of 7-10 years or so. Goldfish have a protective mucous coating over their scales and anything that damages this should be avoided, such as ‘petting’. You will see photographs, particularly on Chinese goldfish websites, of fish like ranchu being displayed out of water in the palm of the hand; breeders do use hands to transfer the slower-moving types between vats and display tanks, but you need to know what you are doing, or you risk the fish flipping out of your grasp onto the floor. Breeders always transfer the faster types with nets. Hands should be washed and rinsed before undertaking tank maintenance and no chemicals such as creams, sprays or polishes should be allowed to enter the tank. Feeding from the hand is potentially risky, in this respect. Any sick fish should be moved with a net. For absences of less than a week, goldfish can be left unfed if they are healthy and are not young fish that are being reared. For one or more weeks’ holiday, temporary carers should be given clear instructions on portion sizes and the dangers of overfeeding and pollution. Portion sizes should be reduced to help compensate for lack of water changes. Goldfish need more space than you might imagine, because of their oxygen requirements. A two-foot tank should really be considered the minimum because smaller volumes of water can pollute more quickly than larger volumes; an ideal size for a few fish is a three-foot tank. 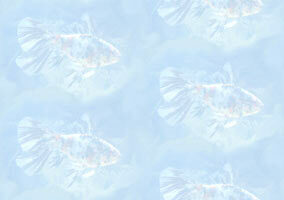 See our Aquarium Calculator to work out how many fish can be kept in tanks of varying length x width. Any shells, wood or decorations that could alter the water chemistry (pH and/or hardness) or could injure the fish should be excluded. Goldfish are adapted to the diurnal cycle of day and night, so should be provided with light during the daytime, either natural if sufficient (and without the risk of strong sunlight overheating the water) or from fluorescent tubes. There is always a fine balance between the right amount of light for seeing the fish and permitting plant growth and excess light that can cause runaway algal blooms that wreck a tank. If your lighting is causing problems with algae, reduce it and check for causes of poor water quality. Hardier types such as common goldfish may be kept in outdoor ponds that freeze over in winter (the fish are safe if the pond is deep enough and a small hole in the ice is maintained), so the only real reason for a tank heater indoors is to stabilize temperature if it is otherwise subject to unnatural fluctuations that could stress the fish. Temperatures of about 20°C/70°F should be regarded as the upper limit, and temperatures of about 10°C/50°F as the lower limit for the fancier varieties. Breeders gradually warm their ‘fish houses’ with space heaters in early spring to encourage readiness for breeding and to avoid late cold snaps. See our Aquarium Calculator to convert Fahrenheit to Celsius. Goldfish sift substrate looking for food, so the tank substrate should not be sharp, too large (that could get stuck in the mouth) or too small (that could be ingested). Rounded beach gravel is ideal (if it is free of shell fragments that will harden the water or could cut the fish). The constant sifting will level most aquascaping undertaken by the fishkeeper, so retaining rocks or bogwood are useful. The gravel can become foul and turn black if the tank is polluted through, for example, overfeeding, and a gravel cleaner (a large-diameter siphon, available from fish shops) can be used to keep the gravel clean. Breeders use bare-bottomed tanks for ease of maintenance. Stocking levels are a vital consideration: see our Aquarium Calculator for how many goldfish you can keep in a tank of given dimensions. See the various goldfish pages for how large each variety can grow, and please note that it is a myth that goldfish size is limited by tank space: you should allow for adult-sized fish when working out your stocking level. Goldfish can tolerate a very wide pH range, but they prefer water with a mildly alkaline pH of about 7.2 - 7.5 and it is kinder to provide their natural conditions. Most tap water in UK falls within the ideal pH range described above, as the water companies modify the pH to prevent pipe corrosion, so goldfish keepers can safely use tap water as long as it is ‘conditioned’ to remove the chlorine/chloramine added by the water companies to kill microbes and make it safe for human consumption. To find out the pH and hardness of local tap water, one can purchase the appropriate test kits from aquarium shops, ask experienced fishkeepers in the area or ask the water company (who will also tell you whether chloramine has been routinely added). To condition tap water to remove dissolved chlorine, just leave it standing for a couple of hours or more. To remove chloramine (and any dissolved heavy metals over and above normal tolerances), purchase a water conditioner from an aquarium shop and add it to water changes according to the product instructions. Water changes should be at the same temperature as the tank water, so either leave the water standing to equilibrate to room temperature or adjust manually at the same time as adding any water conditioner. Water changes are another vital consideration; see Golden Rules for further information and advice. Goldfish tanks need power filters (external or internal) because of the large amount of waste the fish produce. Airstone-driven filters may perhaps be OK for smaller tanks with very low stocking levels. The fancier varieties will struggle to maintain position if there is a strong water current in the tank, so this should be avoided. Undergravel filters are not suitable because goldfish sift substrate through their mouths (which can degrade the function of the filter) and (despite contrary advice elsewhere on the Internet) because they are not powerful enough to cope with the amount of waste (see Golden Rules for further information and advice). All filters should be left running 24-hours per day, every day, all year. Please Note: Unconditioned water will kill the filter bacteria that detoxify the ammonia secreted by fish to nitrite and nitrate. Remove some tank water for cleaning filters. An air pump will help oxygenate the water through circulating it to the surface, which can help in warmer tanks as warmer water holds less dissolved oxygen. But an air pump on its own will not substitute for a proper filter as it does not provide any means of detoxifying the fish wastes. Goldfish bowls are a death sentence to goldfish in almost all cases because they are too small, with too small a surface area for enough oxygen to dissolve to support even a single fish, let alone to house a proper filter. Everything you read in this set of FAQs should lead you to this conclusion, if you didn’t know it already. The problem is that goldfish bowls look pretty and are considered traditional. In the Far East, the short-bodied varieties may be presented in bowls for judging at shows, but they are returned to tanks or vats immediately after being benched for any judging. Serious fish shops refuse these days to sell goldfish bowls, and if you were to enquire as to the one plea that all goldfish websites and books emphasize in common, it would be don’t keep goldfish in bowls. Please follow this advice! All new goldfish should be quarantined to prevent the introduction of pathogens to a healthy tank. This means having a separate, (usually) smaller tank in which to keep new fish in small numbers for a fortnight under observation to ensure they are free from visible or behavioural signs of disease. The filter for such a temporary tank should be kick-started by taking some filter media from the main tank’s filter that is already populated with filter bacteria. This is one case where, to save expense, a bubble-up filter powered by an airstone might be OK. But the cost of a small internal filter could be less than the cost of good stock that might be lost. The one exception is buying fish from a goldfish club member whose stock is known to have been disease free for an extended period of years, but, if in any doubt, quarantine! Aquarium salt (which is different from table or cooking salt and should be bought from aquarium shops) is a traditional cure1 for such diseases as fungus and finrot, or general ill health such as clamping of fins and listlessness. The correct dosage for goldfish (which is different for tropicals) will be stated on the packaging. But there is no reason for routinely adding salt to goldfish tanks as a preventative or just for the sake of it. There are better ways of maintaining high water quality (see Golden Rules for further information and advice). Please see the FAQ above on Feeding for the effects of inappropriate food on the goldfish digestive system that can lead to bloating (constipation), floating and sinking (swimbladder trouble). Fishkeepers need to learn quickly to recognize the difference between the smaller white spots found anywhere on the body and fins that are the cysts of ‘Ich’ (the Ichthyophthirius parasite - see Diseases) and the larger breeding tubercles (white pimples) on the gill covers and on the leading edge of the pectoral fins of male fish during the breeding season (see Sexing). 1. Fish Diseases: Diagnosis and Treatment by Edward J. Noga, WileyBlackwell 1996, Page 254.